In 2007, Novocortex engaged readers of marketing blogs in co-creation of ads for a new translations service – 24hTranslations.com. 24h Translations offered online translations by humans at discount prices. Novocortex developed a creative concept for the ads – Words Can Be Expensive – and asked readers of marketing blogs to send us their own ideas of expensive words. The most expensive words were used in online ads and posters of 24h Translations. Novocortex needed to create buzz around the launch of 24h Translations. The main target group for this online translation service were marketing and sales managers of Dutch companies and owners of internet shops. Most of them read weblogs and e-zines about marketing. Some of them are quite creative. That’s why we decided to organize a co-creation / crowdsourcing action in Dutch marketing blogs. Novocortex developed a campaign concept illustrating how expensive some words can be. For example, a hobby of Roman Abramovich who bought the Chelsea Football Club cost him over 500 million dollars (see this ad above). 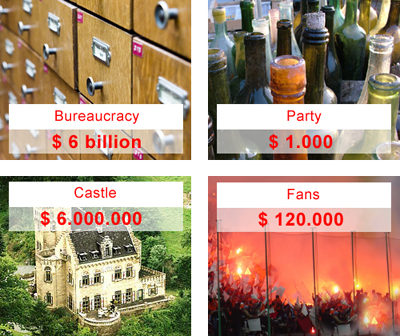 And a great party could cost you over 1.000 dollars (see below). But even the most expensive words can be translated for a fixed price on 24hTranslations.com. In February 2007, we invited readers of marketing blogs to send us their own ideas of expensive words. Our invitation generated buzz around the brand and draw attention of about 50.000 blog readers. The best concepts were used in online ads and posters of 24h Translations. The winning idea illustrated how expensive “democracy” can be, as costs of the Iraq war aimed to restore democracy exceeded 413 billion dollars at that time. See other examples of expensive words below (the “Fans” ad refers to fines imposed by UEFA on football clubs for fans’ misbehaviour). Most of the blogs that placed our invitation to co-create, published the 24h Translations ads in order to show results of the crowdsourcing action. This way, 24h Translation received free media exposure and thousands of visitors. And the blog articles about our campaign appeared on the first page of Google for “online translations”. The co-creation campaign for 24h Translations was developed by Novocortex in co-operation with Red Graphic. The campaign was awarded on the Red Apple festival in Russia in the Innovative Advertising Concepts category. In 2009, the Dutch magazine for entrepreneurs Sprout published an article about the 24h Translations campaign. Read about other digital campaigns by Novocortex, where we used social media to spread the message: The Best Job In Russia and the viral campaign World Championship Nose Cleansing.